Bitterly cold outside, gobos of falling snow on entering the performance space and festive music filling the venue all combine to set the tone for Maskers’ annual Christmas show in the intimate location of the Studio; with cabaret-style tables and a minimalist set, director Meri Mackney invites the select audience to ‘join in with all the songs, boo the villain, cheer the hero and chant the melodrama catchphrase’. 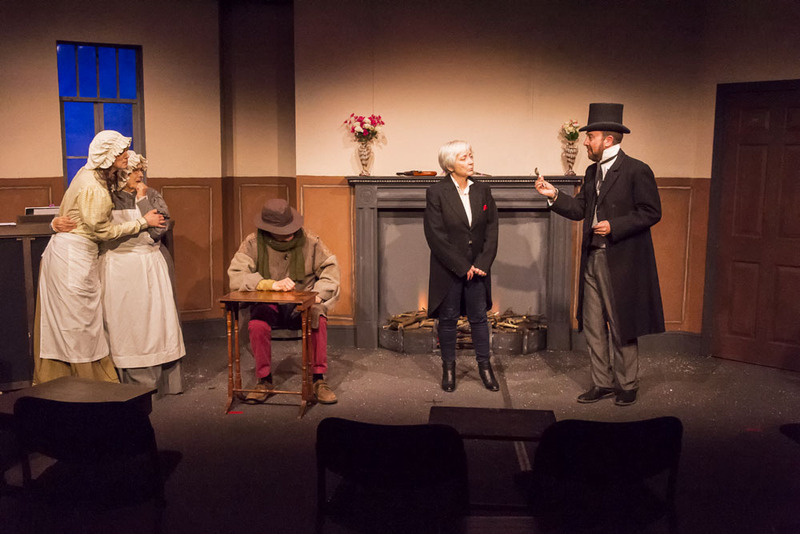 As this suggests, this year’s December show has a wide variety of entertainment styles on offer: the first half provides a mixture of literary extracts, poems and music, followed by an interval of mulled wine and mince pies brought to your candle-lit table, while the second half is an adaptation of an original comic melodrama (originally written by long-standing Masker Graham Buchanan, here adapted by Mackney and her cast). 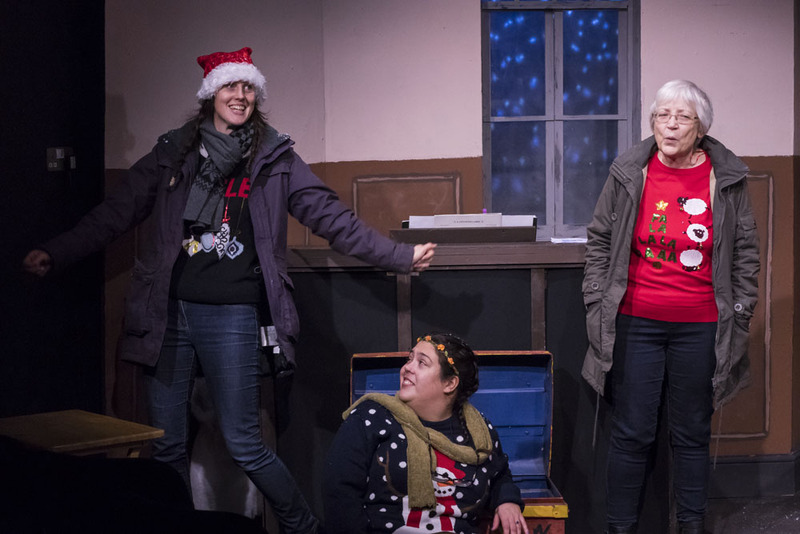 The separate elements are seamlessly interwoven during the first half to create a single narrative, with some unexpected cameo appearances and nice comic touches – including a humorous use of a Christmas tree as a microphone! Although some are more musically able than others, they all have an endearing enthusiasm that engages the audience and encourages them to participate; it is refreshing to be encouraged to sing along, too (they even provide songbooks on the tables so that there is no excuse for getting any words wrong!) and helps to create a jovial evening. Live music from Jill Desborough (piano) and particularly Eric Petterson (folk voice and folk guitar) are a nice touch. 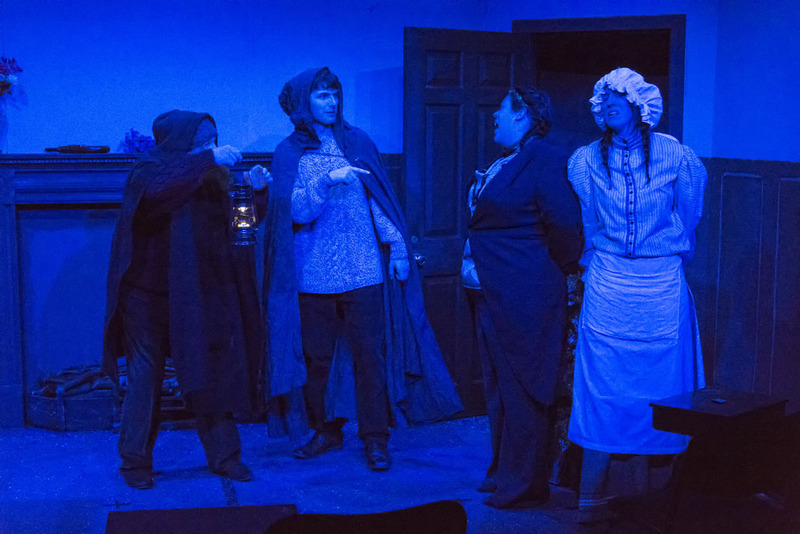 The set is cleverly designed and dressed, but it is the lighting, special and sound effects (designed by Clive Weeks and Tom Foyle respectively) that make such a smooth transition between outside and interior scenery. The atmospheric lighting and chilly sound effects combine to really enhance the wintry effect of the first half. Most of the show is off-book (and full credit to the cast for getting out of a sticky moment themselves, where other companies might have relied on a show prompt), but the passages from classic literature are read, being incorporated into the show as the cast of characters finding scripts in an apparently abandoned house, Crossleigh Manor. 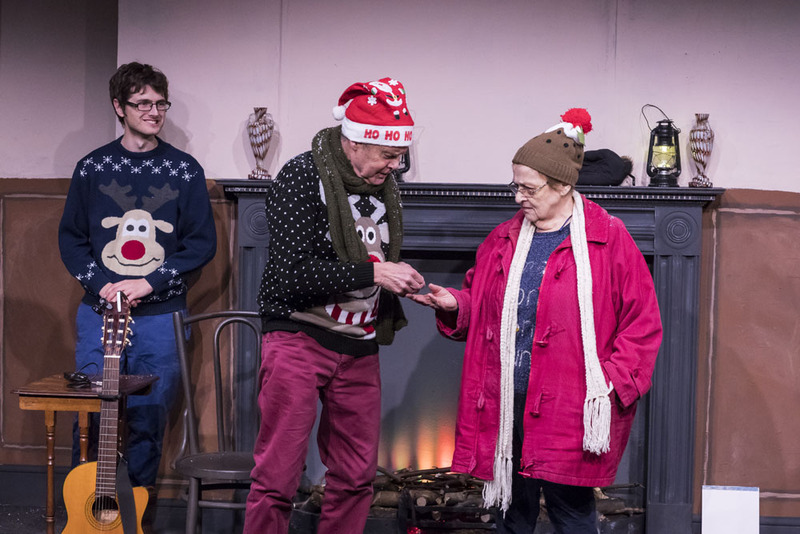 However, this is not as simple as it might seem; Chris Baker’s monologue from Cider with Rosie and Petterson’s rendition of Betjeman’s Advent 1955 show how much skill is required to perform these well. Their rich vocal quality and Petterson’s performance value really help the words leap off the page to create beautiful images in your imagination and are very reminiscent of good quality audio/radio dramas. On the other hand, Jonathan Shepherd’s silent performance as the Grinch shows how gestures, body language and facial expressions can speak volumes in themselves, never mind using actual words. 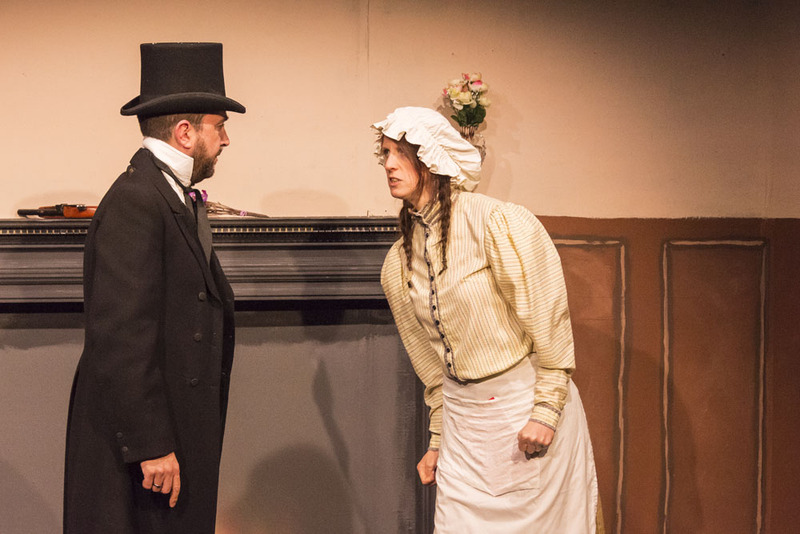 The second half of the evening is an over-the-top, tongue-in-cheek melodrama, a play within the play, set in the rural Victorian country estate, aka Crossleigh Manor, of Sir Jasper (Shepherd). He is obsessed with his maid, Daisy (Jo Fox), who is desperate to get her away from her mother, his housekeeper (Baker). 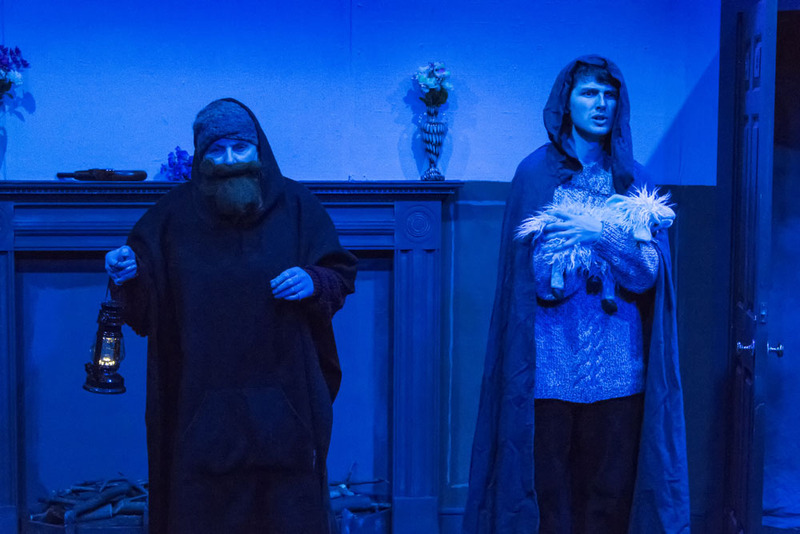 Sir Jasper is meanwhile trying to evade the amorous advances of Lady Cynthia Farquaad (Bonnie Kaye) while ingratiating himself with her brother, Lord Anthony Farquaad (a good performance by Desborough) – but who is Old Tom and why is he so cold? This is a really fun element, with a style all of its own! 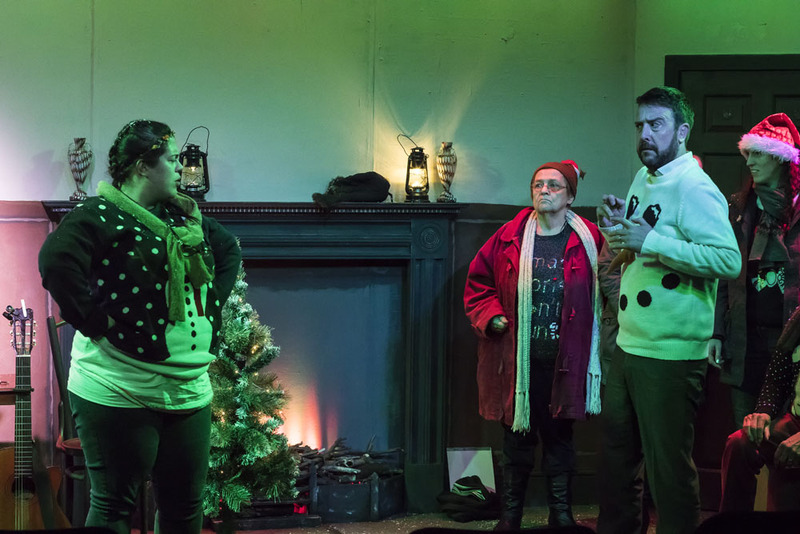 Let It Snow, Let It Snow, Let It Snow is not cutting-edge theatre, it’s not the masterclass that Maskers’ recent Antigone was, but it is a very enjoyable, amiable piece of festive frivolity and provides some much-needed Christmas cheer – enjoy! A Miscellany of Christmas Mayhem! 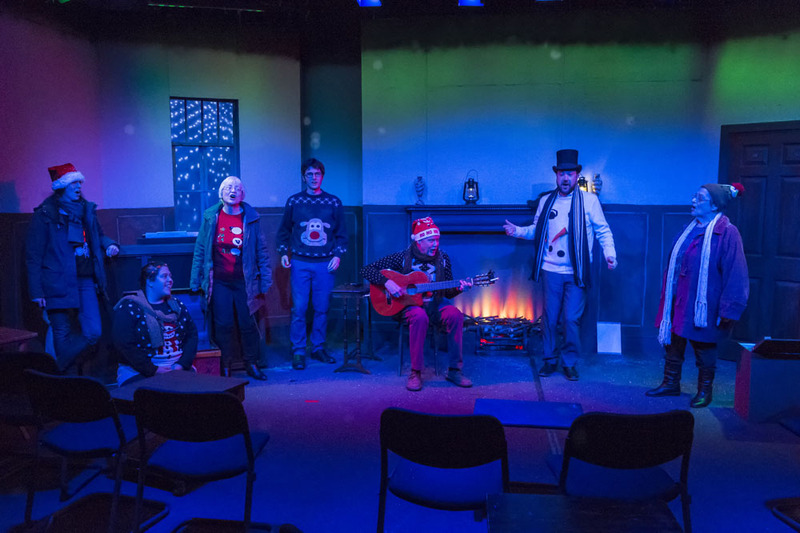 Let it Snow, Let it Snow, Let it Snow or Mayhem at Crossleigh Manor, is our usual mix of Christmas-related songs, poems and prose readings, topped off with a Victorian melodrama and ending with a selection of carols. 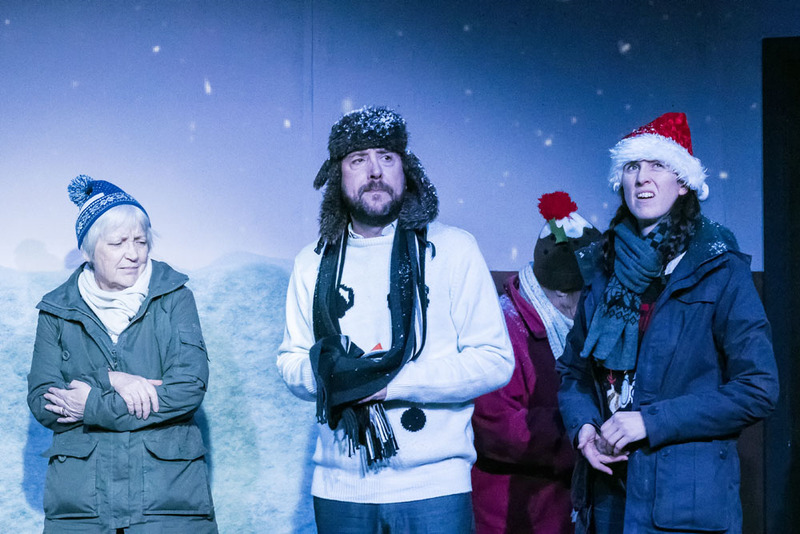 This show guarantees to send you home full of the Christmas spirit – and not just because of the free glass of mulled wine! 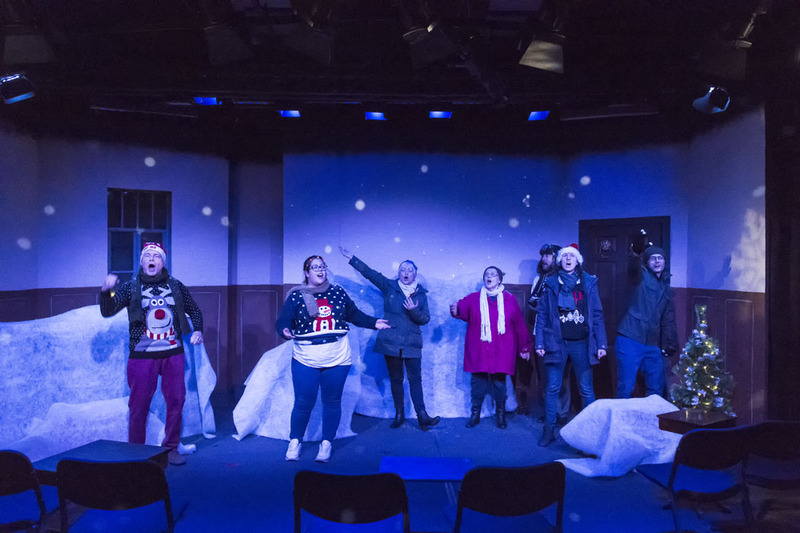 The show follows a group of carol-singers who have decided to try their luck at an outlying manor house only to find it deserted and themselves cut off by the heavily falling snow. Nothing daunted, our group set out to explore the manor house and find that the old family were also keen on Christmas merriment. They decide to entertain themselves by putting on a show in the style of the Victorian inhabitants of the house. Among the many poems and readings they find is a Victorian melodrama, Mayhem at Crossleigh Manor, apparently written about the house in which they find themselves. 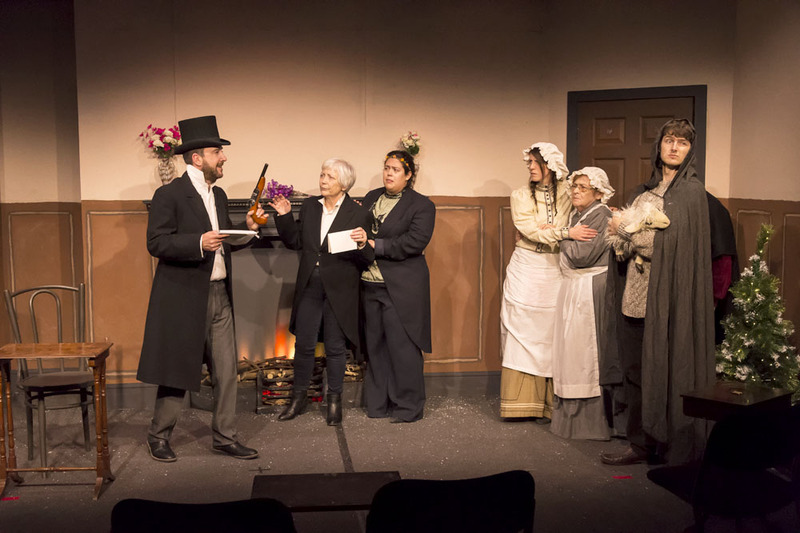 They decide to perform this in full, using costumes and props they have found in the house. Is it their imagination or are there now more people than they started with? We hope the audience will join in with any of the songs they know. Song sheets will be provided for the carols at the end. Meri has been a Masker for many years and has been involved with a large number of productions both on and off-stage, indoor and open-air. She has been in and/or directed several of the Christmas shows and is really enjoying the particularly light-hearted nature of this year’s show, which she scripted (with some help from the cast) as well as directed. Chris is a long-standing member of the company, having been involved with many productions both on and off stage; she is currently the treasurer. Her last appearance was as Helen Dixon in Ten Times Table at the Nuffield Theatre. She is glad to be involved once again with our Christmas presentation. Jill has been a Masker since 2014 and is delighted to be involved once again in the Christmas Show – her third since joining. In that time, she has also had roles in a touring production of Richard II, Metamorphosis at Maskers Studio and two outdoor shows at Hamptworth Lodge, Jungle Book and Pygmalion. She is looking forward to rehearsing and performing with a lovely group of people – but facing the challenge of displaying her dubious prowess on the piano with some trepidation! 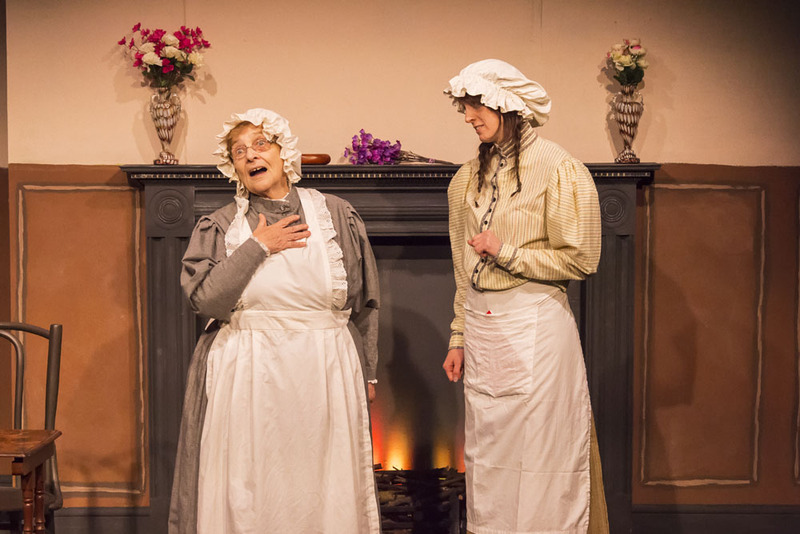 Jo has been an active Masker for 10 years and has played a variety of roles, including a lady in waiting in Anne Boleyn, Gwendolen in The Importance of Being Earnest and a monkey in The Jungle Book. 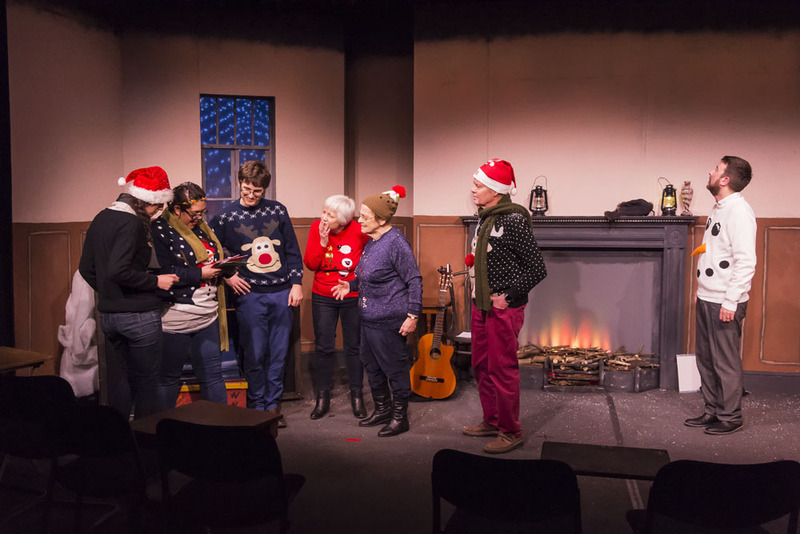 The Maskers’ Christmas show really helps to kick off the most wonderful time of the year and Jo is looking forward to getting into the Christmas spirit during rehearsals and having fun with some singing and dancing, as well as acting. Bonnie has loved performing for as long as she can remember. She spent a lot of her youth acting at the Nuffield Theatre in shows such as The Great Gromboolian Plain, Skellig, and The Red Red Shoes. Bonnie made her debut for Maskers at last year's Christmas show Mistletoe Junction. 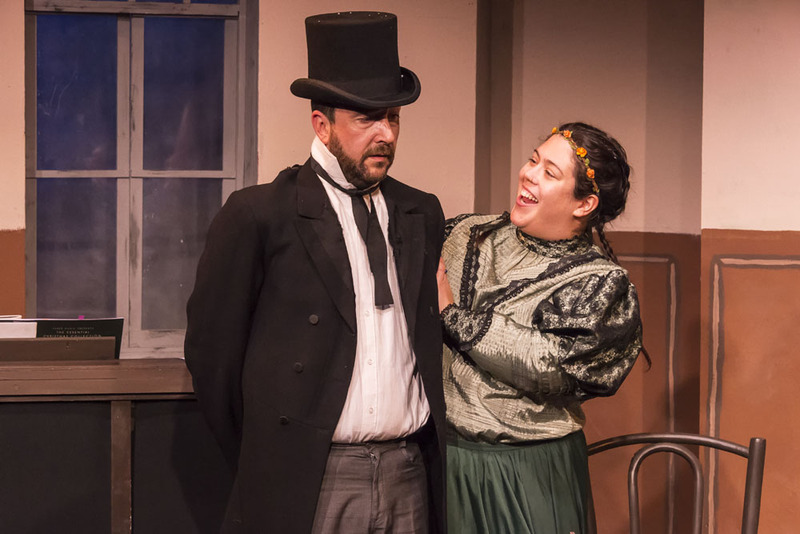 Since then she has enjoyed playing a flirty French maid in An Italian Straw Hat and is looking forward to playing a flirty upper-class Lady in this year's Christmas show Let It Snow, Let It Snow, Let It Snow. Robert’s first ever role with Maskers was as a stage manager on the 2011 Christmas show Jingle Bells. In the last six years he has taken on a variety of roles, both offstage and onstage, and now comes back to the Maskers’ Christmas show where it all started. He recently appeared as Haimon in Antigone at Maskers studio and will step into the director’s role for the first time in October 2018, directing Happy by Robert Caisley. Eric started a late acting/singing career as the guard in Forward to the Right and Jack in The Weir. He played Gaunt in a touring version of Richard II and enjoyed picking up young ladies in The Yalta Game. He was Jo Gargery, Wemick and Drummel, sometimes in the correct costume, in Great Expectations, and a particularly bolshie guard in Antigone. 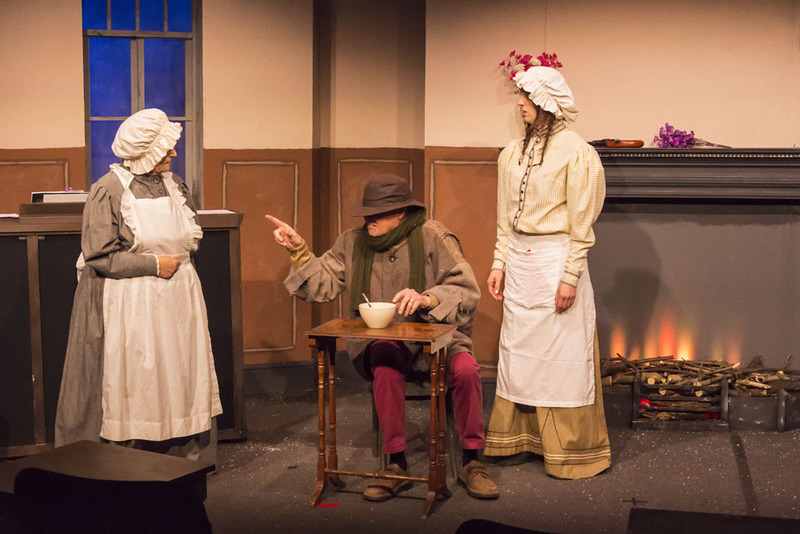 Regular attendees at Maskers’ Christmas shows may recognise Jonathan from his appearance in Room at the Inn in 2015. In that show he played a variety of characters, including a dashing young RAF pilot, and Father Christmas! Jonathan has also appeared in a selection of other Maskers’ shows over the years, including Pride and Prejudice (2007), Ann Boleyn (2013) and Our Town (2014). Jonathan played Gregor Samsa in Metamorphosis for which he received the Best Actor In A Drama Curtain Call Award for 2016, followed by a stint at The Mayflower Theatre in Southampton in An Inspector Calls. Also in 2016, he played Professor Higgins in Pygmalion. This year roles include Boby in An Italian Straw Hat at The Nuffield and Mr. Darcy in Pride & Prejudice for RAODS. He was back in the open air at Hamptworth Lodge playing Phileas Fogg in Around The World In 80 Days. It’s been a busy couple of years! Jonathan enjoys playing a wide variety of characters which is just as well as Michal in The Pillowman (RAODS) could not be more different to any role he has played before. He is relishing the Christmas spirit that this current production will bring. Ticket price includes a glass of Mulled wine or fruit Juice and a mince pie.